I bet the above awkwardness is the one you've encountered. In spite that MKV is highly acclaimed for its open source, this format is not created for all media players. In contrast, AVI is superior to MKV for its full compatibility with most devices. So it's seems wise to employ a program that can transcode MKV videos to AVI format. Fortunately, with technologies developing day by day, we have unlimited choice of different applications available online, even the little-known MKV to AVI converter (freeware included) is no longer a hard nut for you to find unless you are a downshifter. macXvideo - free transcode MKV files to AVI MP4 MOV FLV MPEG WMV, etc. regardless of your MKV videos are encoded in H265/HEVC, AVC. Also process and import MKV to iMovie/iTunes, iPhone! It's generally acknowledged that the cheap buyer takes bad meat. So when facing MKV HD to AVI converter freeware, people may question about its features, output video quality, conversion speed, or some others. Actually, these are indispensible elements while choosing 2019 transcoding freeware for converting MKV high-quality videos to AVI format. 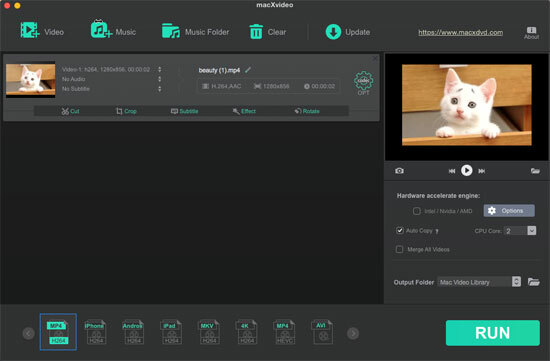 So upon taking these elements into consideration, I finally introduce macXvideo to you as it is the most appropriate free MKV to AVI converter that suits all your needs without paying even a coin. 1. Free trancode AVI from MKV format videos with 3 steps, no virtual quality loss, thanks to High Quality Engine, resolution/bit rate adjustment and auto copy features. 2. Further compress MKV file size by up to 98% reduction if it's too large for your mobile devices. 3. Also convert MKV to MP4, MKV to MOV, MKV to WMV, YouTube to MP4, AVCHD to AVI, 4K UHD to 1080p Full HD, etc. 4. Support you to add subtitles to MKV, extract subtitles from MKV, remove unwanted video clips from MKV, cut off black borders, etc. 5. Advanced video decoding and encoding engine to ensure you a smooth and stable MKV files to AVI conversion, no crashes or stuck problem. Free download this superb MKV to AVI converter freeware for 2019 on Mac OS X, load the MKV files by hitting "Add File" button. Select the target AVI format from the bottom of the window. In addition, you can configure audio and video settings for each output format when it comes to resolution, frame rate, bit rate, sample rate, etc so as to better fit your player or devices. Click Folder to choose the path where you want to save the output files in. After finish the above steps, click the "RUN" button to start MKV files to AVI conversion for free on your Mac computer, you could view the conversion progress and are able to cancel the converting process at anytime. How do you play MKV on Mac? Three ways are introduced to play MKV on Mac(MacBook Pro/Air, iMac, Mac Mini) perfectly. Read to learn how to play MKV on Mac OS. This tutorial is about how to free convert MKV to QuickTime MOV on Mac using MacX Free MKV Video Converter. This Mac MKV to MOV converter can easily convert MKV to MOV for playback on Mac QuickTime, iPhone, iPad, iPod easily.